This is kind of a long post so bear with me, but am posting this to hopefully help those out who are having similar issues with their Ignition/Coil Fuse 15 blowing. Back in December 2017, I was driving along at around 55 MPH when I noticed my car suddenly cut out on me with no error codes or failures beforehand. I was able to pull off to the side of the road out of traffic and called AAA to have the car towed back to my house. After looking things over and reading a few blogs, I decided to replace the spark plugs (all 16 of them). I also checked Fuse 15 (which was a 20 amp fuse) and saw it had blown so I replaced it. After replacing the spark plugs and fuse, I started the car up with no problems and drove it just fine for 2 months. In February 2018, Fuse 15 blew again when I was driving home in a 35 MPH zone. I figure what the problem was, so attempted to replace Fuse 15 with a new one. The ignition starter worked, but the car would not run. I could not get the engine to stay running even though the starter was turning the engine. I had AAA haul the vehicle home again and this time, replaced the 8 coil packs. The car started up and ran just fine again for 5 months. In early July 2018, once again, and this time on a remote road, Fuse 15 blew again and I attempted to start the car after replacing the fuse, but the starter once again kept turning and the engine would not run. At this point I hauled the car back to my friend's driveway and attempted to figure out what the issue was. I tried a new TIPM (Front Integrated Power Module) along with a new Front Power Control Module (for around $1,000.00) and was able to successfully start the car up and keep it running. I shut it down and then went back to start the car again later, but it popped Fuse 15 in the new power distribution which had new fuses and relays. At this point, I started pulling fuses and relays from both the front and rear integrated power modules, but I must have pulled too many because I received a flashing red light in the dash (the built in anit-theft device) and at this point was unable to get any further on the car without having it towed to the Chrysler service department. The car was at the Chrysler service department for 3 weeks and with no resolution. They could not figure out what was causing the short circuit. Their recommendation was to replace the Wireless Receiver Module (the module which is wrapped around the ignition) but it was going to cost $1,100 and they were not sure if this would solve the problem. I declined and had AAA haul my dead car back to my garage so I could figure out what to with it. Since I replaced the Wireless Control Module though, I had to have it towed back to the Chrysler service department to have them program the key to the receiver. They were able to do this successfully and I drove off with no problems, and drove it around for about 2 weeks with no problems. But once again, I attempted to pass someone and hit the accelerator, and Fuse 15 blew again. Fortunately I was in a spot where I could coast into a parking lot. There I replace Fuse 15 and drove home, but did not drive the car after that until I could figure out what other areas I should look at. I decided the next step was to pull the whole ignition, injector, sensor wiring loom out and check if there were any wires which may have become frayed. I also pulled out the Starter to Alternator cable as this has a fusible link as well just to make sure. After removing all of the housing, none of the wires were frayed or looked even close to being damaged. The only question was the Yellow/Gray wire from the starter, which, when I looked at a wiring diagram, connects to a relay, and this relay connects to Fuse 15 which kept popping on me. The wires closest to the engine block have this heat shield, and that heat shield is wrapped in a heat reflective material (looks line tin foil). 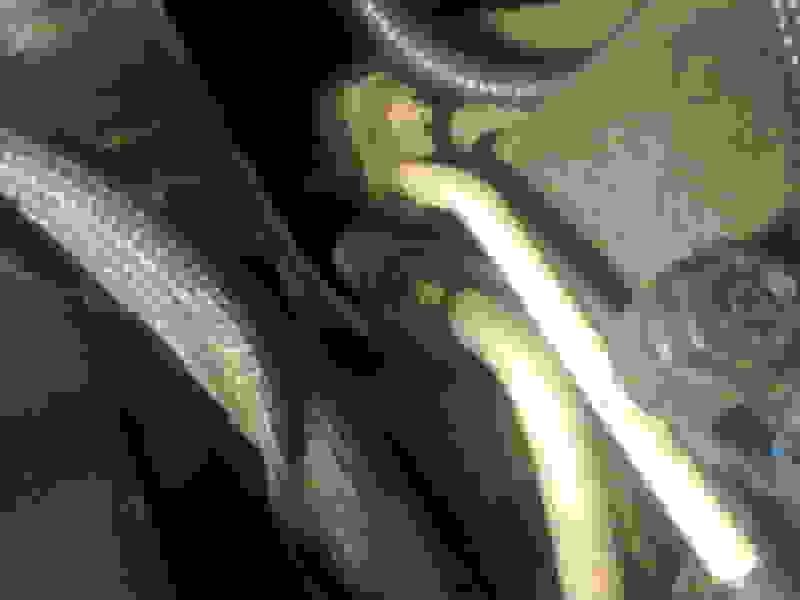 The Yellow/Gray wire which connects into the starter has a fairly large gap at the back where the wire connects to, and this is exposes. My theory is over time, the edges of the heat shield have frayed, and parts of the tin-foil substance were hanging off the wrapping as well as falling into the back of the Yellow/Gray wire, and I believe this is what was causing the short circuit. The tin-foil wrapper is not electric-neutral either. 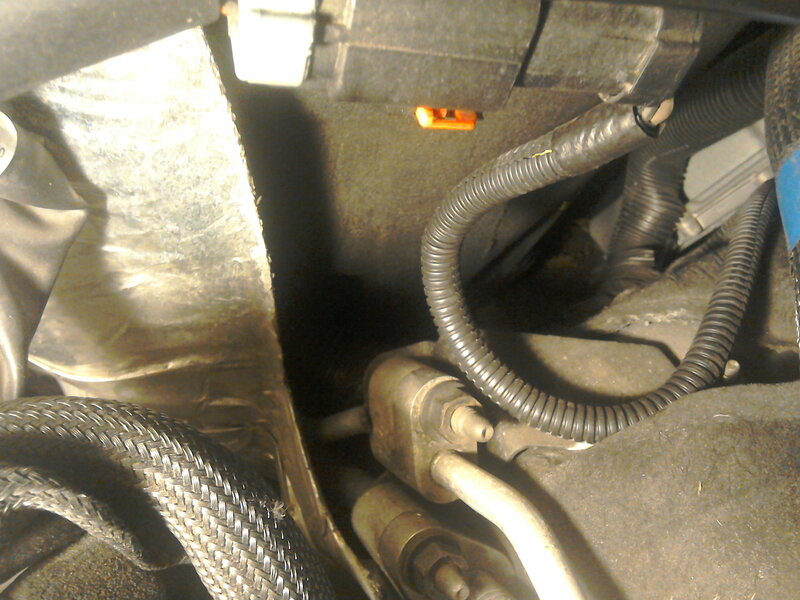 As the engine would torque and move during acceleration, those lined heat shields were touching the engine block and since parts of the tin-foil were stuck in the back of the yellow/gray wire connector, it was pulling too many amps through that circuit somehow. Once again, I'm not sure, and could not confirm it, but I've added some pictures as well. 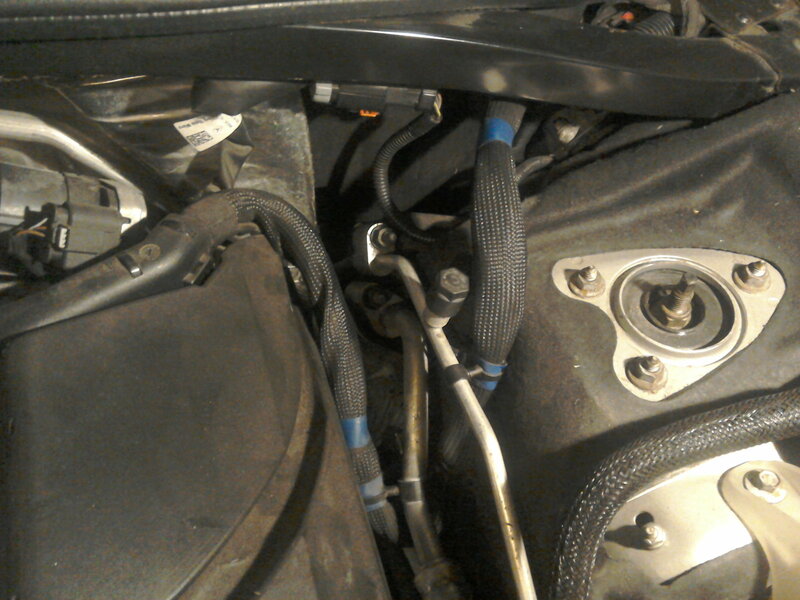 Instead of the tin-foil wrapped heat shields, I replaced those with PCV tubing. I'll have to check this, but so far the engine is running fine, it starts up fine. I've hit the accelerator pedal pretty heavily several times with no blown fuse. Also, just an FYI: when I went back to the owner's manual for the fuses, there were missing fuses in my manual. It's almost like the factory decided to write up one book for all Chrysler 300s, but the fuses and amps are slightly different for the SRT8. I'll include those as well as I received them directly from Chrysler customer service. Last edited by venturec; 09-15-2018 at 10:19 AM. Thank you for a really interesting post. I am a new first time owner of a 300C in the UK, 3 litre CRD 2007, 110k miles. Always wanted one and am loving it! However, went for a drive last weekend and experienced the same problem as you. Driving along at about 40 mph, when suddenly everything cut out. The red lightening flash indicator came on and I coasted to a stop. Car turned over ok but wouldn't start up. Had to call the breakdown recovery and get transported back to my local garage. Not sure if if this is related, but when I bought the car the previous owner thought the battery could need changing (6 years old) as it was sometimes slow turning over when starting and also could take 7 or 8 seconds to fire up even when turning over at a normal rate. Anyway, after trying a few more times to start the car at the garage the next day, we found that the battery was no good. The cold crank measure was virtually nil, so I got a new battery. This still didn't solve the red lightning flash indicator however, there were now no error codes on the diagnostic check at the garage. Finally, the garage found that fuse 15 had blown (also fuse 5). They changed the fuses and the car now works perfectly as before. So I now have a couple of 20 amp fuses in my glovebox as spares in case it happens again but would reallynlike to know the cause. Could it have been the failure of the battery that caused the fuse to blow? If not I will take a look and see if I can find the cables you mention to look if there are any potential issues. AB77, forgive me if I'm stating things you already know, but generally fuses will blow if the circuit is carrying more amps than allowed. This can be caused by a faulty part within that circuit or a short from somewhere else, and when the two circuits cross paths, can cause fuses to blow. A dying or dead battery would not necessarily be the root cause of the problem since the battery has very few amps being passed into the circuit. It has around 12 Volts when the engine is not running, and around 14 when the engine is running due to the alternator recharging it. Voltage, in electronics, is only considered the potential. This is why the battery has a direct connection to the alternator and starter. The alternator has a large amount of wrapped wires around it and when the alternator is spinning, it produces a much higher amount of volts and amps which can power the car. The starter also has large set of wound wires which turns a gear ,and in turn, cranks the engine block. Starters, Alternators and Relays all have copper wires wrapped in a way which can take a very safe low voltage and produce a much higher voltage for the unit receiving that voltage. When you turn the headlight switch on, a low voltage circuit is completed, but those volts go through a relay which in turn can produce a much higher voltage to power the headlights, brights, etc without you getting an electrical shock every time you turn the headlight switch on, or switch on the high-beams. The other items I also checked were my grounding wires for corrosion. There are a couple on the back of the engine which can be reached from the top, and those connect to the passenger side wheel well within the engine bay. There is one which connects the engine block to that same point on the passenger side wheel well, but can only be reached by removing the starter underneath the car. There is also a grounding wire to the car frame almost under the passenger side headliight looking from the top-down within the engine bay. There might be others, but these are the ones I could see and find after looking over the entire engine and reviewing the manuals. I wish I had a better response, but check the grounding wires in those spots for corrosion, clean them up with WD40 or some other cleaning agent, and then check the tin-foil wrapped heat shields near the engine block which protect that Yellow/Gray wire connecting the starter to Fuse 15, and make sure those edges aren't frayed and somehow getting into the back of that connector. You may need to also clean out that connector since it is so widely opened, a lot of junk gets stuck in the back of it. I dipped the connector in brake cleaner and did this for about 20 minutes, until all of the gunk was out of the back of it, and the Yellow/Gray connector to starter was completely clean on the inside. I have had no popped fuses since I rehoused the wires closest to the engine block in PCV tubing, have stomped on my accelerator with no problems, and this makes me think my theory was correct:: as those tin-foil wrapped heat shields frayed at the ends, the frayed parts were sticking into the back of the Yellow/Gray wire connector which connects the starter to Fuse 15, and when those heat shields touched the engine block, it caused a short circuit. Check for loosely connected wires inside the wiring harnesses at the PCV and the Front Distribution box just to make sure no wires within those pig-tails are moving around unexpectedly. Last edited by venturec; 12-02-2018 at 04:25 PM. Thanks again venturec, this is really helpful and I appreciate you taking the time to explain everything so clearly. I am very much a novice with all this so any information is good knowledge for me. I have driven the car 50 or 60 miles since changing the fuse and so far so good, but must confess I would not be surprised if it does blow again. I will take your advice and look for grounding wires and take the action you described. I am not very familiar where some of these are but certainly the photo you posted showing the yellow/grey wire to the starter motor will be a good place to start. Should I use any particular type of PCV tubing? For the other grounding wires I will try and find them based on your great descriptions, thanks! Just to confirm, in your opinion, do you think it is very unlikely that the failing battery could have caused the fuse to blow? I do think the battery had little to do with the fuse blowing, but it is difficult to say without using my electrical circuit testers. Keep in mind all circuits in cars are complete when they are grounded properly. The grounding wires, if they become corroded. or are connected to an area of the car which does not conduct electricity, will force the circuit to "find" a ground to complete the circuit or fail altogether. Shorts-to-ground can be caused by worn wires rubbing together, a bad wiring harness where wires connectors are allowed to move around when the car is moving and hitting dips or bumps in the road, or a faulty part within that circuit where a wire is now loose and hitting the sides of that part which is causing a faulty ground. There are bunch of scenarios which could cause the problem, but overall it sounds like you are on the right track: You replaced the basic component (the battery) which showed it was aging, so that is one item off the list. If it happens again, hopefully this post will help you narrow your search options down a little more to find the fault. For the PCV tubing, I went to my local auto parts store which had them on hand, and had them cut around 5 feet of 19/32 inches of tubing for the larger Starter to Alternator wires as well as the gang of wires which hang down alongside the engine block, and 3 feet of 3/8 inches of tubing (sorry about using the US dimensions) for the smaller wires which break away and connect into the starter, the knock sensor and Crankshaft sensor . Nothing special, other than it is PCV material and very heat resistant. I have part of that PCV tubing touching a very hot part of the engine, and it does not melt. Thanks again venturec for sharing your excellent knowledge, I have learned a lot from you! An interesting point about wires moving as a few minutes prior to the fuse blowing I had been along a rather bumpy track so possibly that may have moved something. I like your approach of eliminating possible issues one by one, so think I will start by covering the wires from/to the alternator/starter which are close to the engine, as long as I can find them using your photos! A job for the weekend! I have delayed looking at this as I have had a problem with the swirl motor, causing the red lightning bolt on the dashboard, with the car going into limp mode. Fortunately, after a lot of research on Chrysler forums, worked out that I could fit a swirl motor emulator, effectively bypassing the swirl motor, which amazingly fixed the problem. Although I have not had any further issues with blowing fuse 15, I am back looking for electrical shorts to make sure it has less chance of happening again. I must confess I am still a little uncertain where to look for chaffed wires. I think I should be looking towards the right rear under the hood (when standing at the front of the car facing the engine). attached are some photos. They look ok to me, but should I also be looking from underneath the engine or should the relevant wires be visible from above?